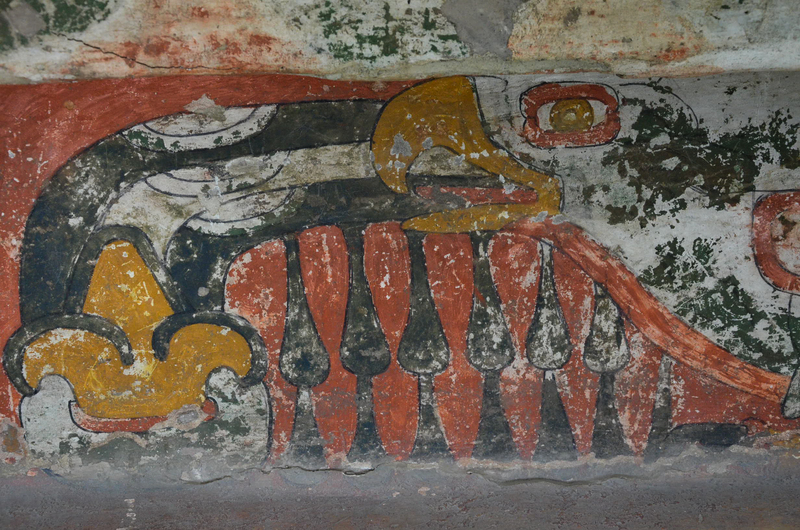 Teotihuacan, the city where people come from the Gods, was named by the Aztecs during their search for the sacred place where they would spot an eagle holding a snake in its beak. It was here they found it. The Aztecs discovered a perfect abandoned site. The earlier builders of the pyramids created the volume, size and shape that would complement the Aztec’s world view, with structures that mirrored the surrounding mountains. There was a sophisticated draining system, spring water for drinking and an urban design based on the orientation of the moon, sun and stars. Because of its location and the orientation of the city aligned along the cardinal points fundamental to Aztec belief, they settled here and built the largest city in Mesoamerica. 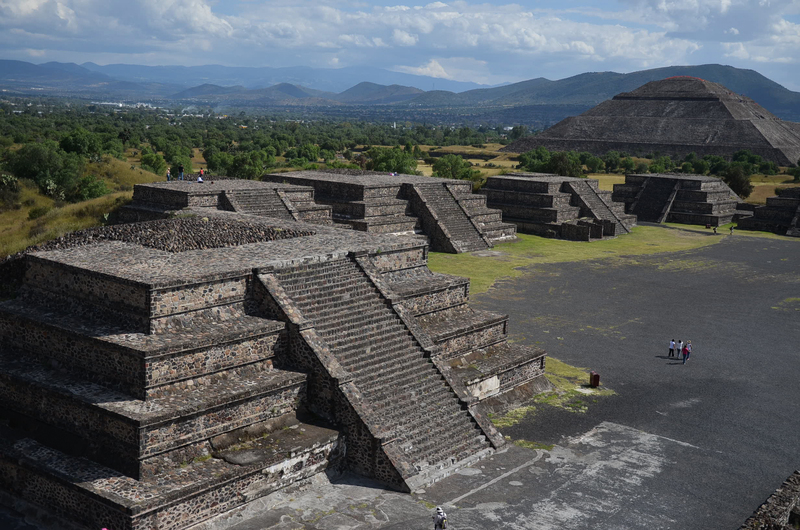 Teotihuacan is an impressive monument to social, political, and religious organization. The people lived in neighborhoods organized according to their skills or craft activities: preparation of agave for pulque and papermaking, corn for tortillas, obsidian for knives and weapons, chocolatl (chocolate), weaving, pottery, etc. Each neighborhood had its own god and political/social leader. 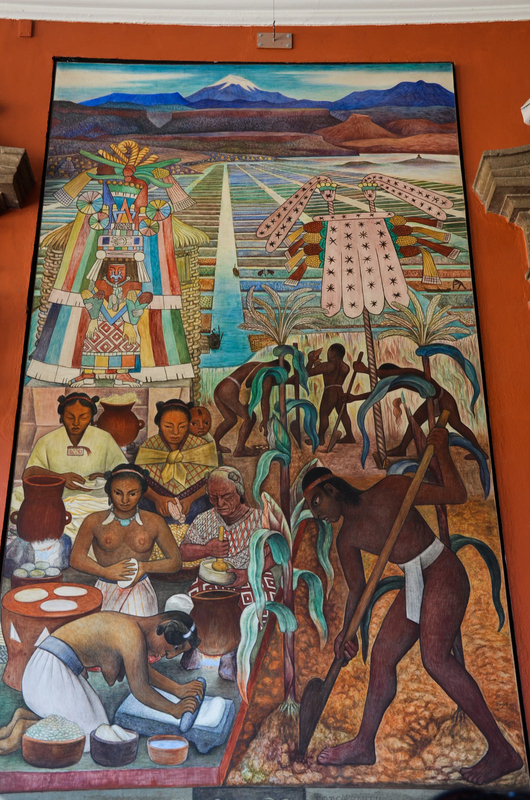 Diego Rivera captures this in his murals that adorn the Palacio Nacional. One gets a vivid picture of what pre-conquest life was like through his eyes. The red-bearded Hernan Cortes brought with him dogs, guns, germs and a will to conquer, subdue and convert the local peoples. Rivera also captures this vividly in his murals. A social and political activist, Diego Rivera was a visual voice for the working poor of Mexico throughout his life. I wasn’t the only one to climb the pyramids. The Pyramid of the Moon is 65 meters high, and YES, I managed to climb it to the top. Though, I must confess, my legs were really sore the day after! The views were magnificent and I could see that the surrounding valley and city could easily accommodate 200,000 people, the number that archeologists say lived here at Teotihuacan’s zenith. Today, the valley is only ten percent of what it was under the sacred mountain. Then, back to Mexico, D.F., where the new temples to commerce and 21st century life remind us that civilization is forever fluid and changing. 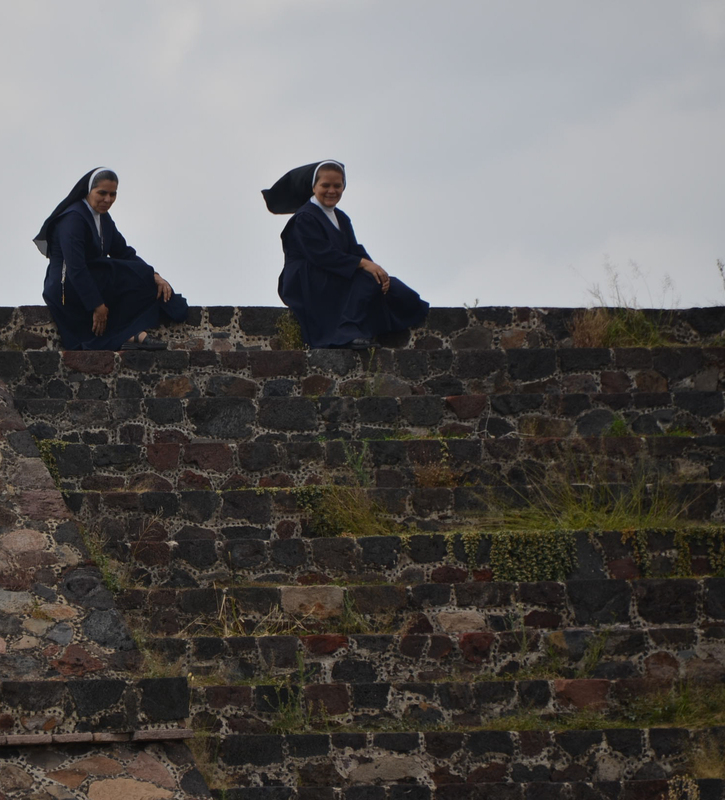 And, come with us starting January 16 for a one-week Street Photography workshop in Oaxaca. 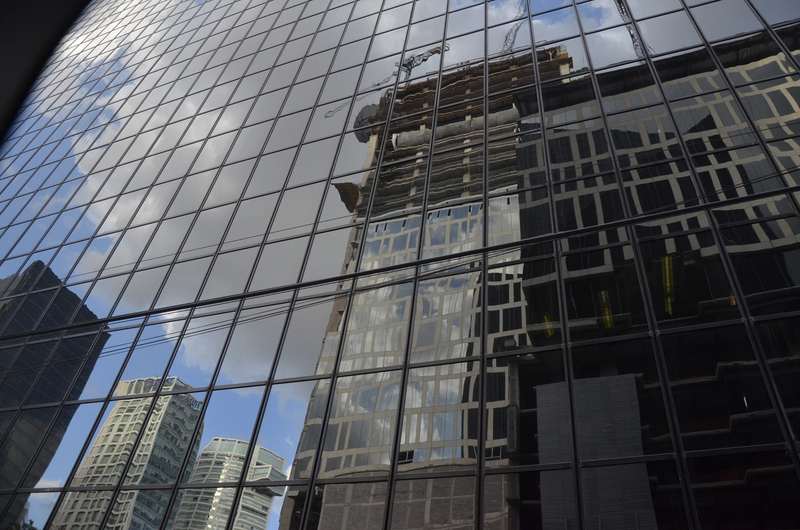 Capture the ordinary to become the extraordinary. This entry was posted in Cultural Commentary, Oaxaca Mexico art and culture, Photography, Travel & Tourism and tagged blogsherpa, Mexico, Oaxaca, Teotihuacan. Bookmark the permalink. Isn’t Teotihuacan actually about twenty miles or so outside of Mexico City? The name of the Aztec’s city in the middle of the lake, where they saw the eagle on the cactus, was Technochtitlan. 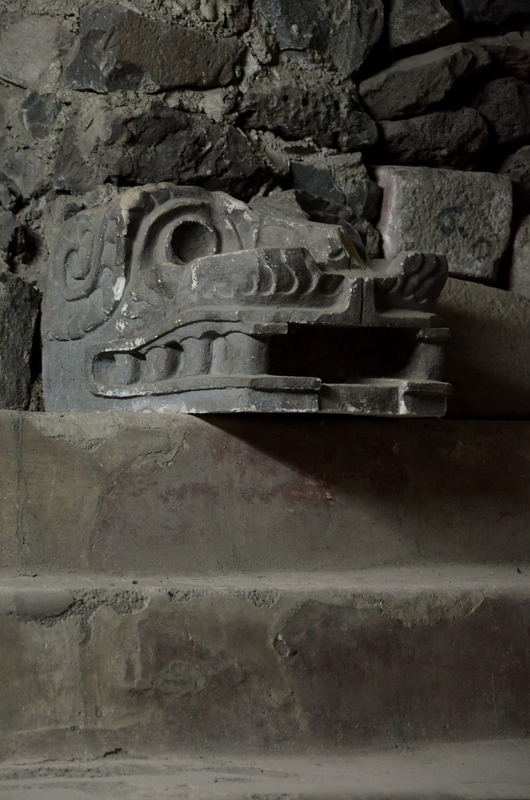 Teotihuacan is the ruins of an empire much older than the Aztecs. Yes, Aimee, you are correct and I’m sorry I did not explain this accurately. Thanks for helping me set the record straight. Teotihuacan is about an hour or so outside of Mexico City. 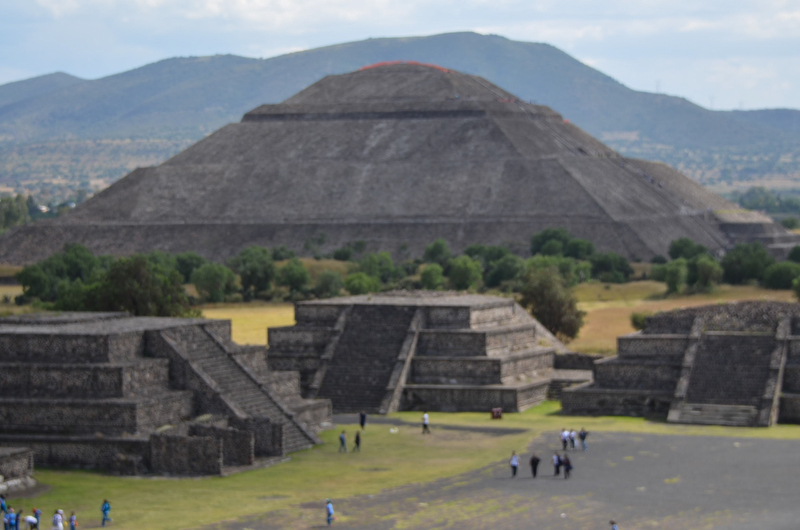 Teotihuacan was abandoned in about 700 CE and when the Aztecs came down from the north, they settled there, creating a base from which to conquer the region. Tenochtitlan was settled in 1325 and became the capitol of the Triple Alliance, in what is now Mexico City. For reference, see http://www.aztec-history.com/aztec-timeline.html It is where the mythology tells us they were to settle in the place where the eagle is perched on a nopal cactus. According to Wikipedia the early accounts don’t refer to the eagle devouring a snake. 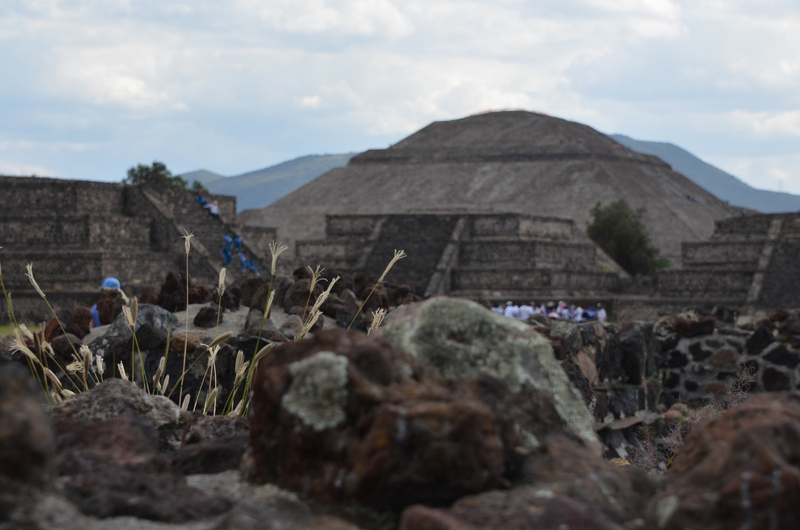 They did occupy Teotihuacan, which was abandoned, and formed their beliefs from the ancient Toltecs, the “originators of all culture.” Teotihuacan was a sacred city to the Aztecs; they claimed that the current age was created from Teotihuacan. They adopted the architecture and religious objects they found there. It is always a thrill to follow your adventures- thank you! And where on earth I’d you find those beautiful gourds on your banner?! They are sensational! I have a nice little collection but they pale in comparison. Hi Marnie, always great to hear from you! The gourds are from the Tlacolula Sunday market. Colorful. Plentiful. A great photo op.